There is always a large amount of rumors surrounding upcoming Apple devices but new iPhones always seem to attract the most attention. This is already the case with a leaked photo that its uploader is claiming to show the iPhone 6. An anonymous Twitter user who is going by the username @mornray886, released a set of photos revealing what appears to be the shell of the new iPhone 6. The picture shows the core structure of the device with a larger screen, Touch ID, as well as an aluminum backing. This leak does support previous rumors suggesting that the iPhone 6 would include a larger screen but other than that, there is no way to currently verify the legitimacy of mornray886’s picture. Sonny Dickinson, the same blogger that released leaked shots of the Galaxy Note 3, was the first to show off the iPhone 6 outside of the anonymous Twitter user that posted the original pictures. Dickinson told MacRumors that the pictures had originated in China, suggesting that they are from “supply chain” sources. However, as we have seen in the past, images coming from China that are posted on Twitter have a tendency to be fake. Other iPhone 6 rumors have suggested that the new Apple flagship will be released sometime in September with a bezel-free design. The bezel-free aspect of the iPhone was also supported in today’s photo leaks. As these pictures are only showing the shell of the iPhone 6 and the device itself is not due until later this year, this design may only be a prototype that Apple has considered. It is also very common that knock-off devices meant for rumors are created with the sole purpose of stocking the rumor fire. Whether or not these pictures are just that has yet to be seen. Summary: Images of what appear to be the iPhone 6’s shell have been leaked. 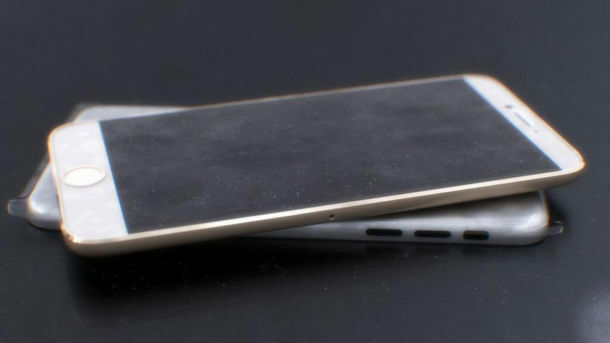 If they are legitimate, the iPhone 6 appears to have a larger screen and aluminum backing.